Queuing for the first bite of the Apple. I suppose it had to happen eventually. This morning I finally succumbed to the cult of Mac and having been persuaded by the WWDC conference videos and a certain Apple fanboy friend of mine, I decided to get up bright and early to queue at an O2 store and see if I could get my hands on the new iPhone 3Gs. Continue readingQueuing for the first bite of the Apple. 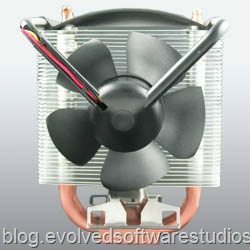 Which is better; Stock or Aftermarket CPU Fan? 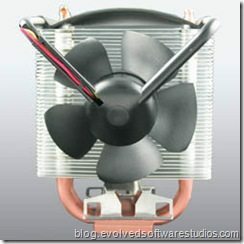 Continue readingWhich is better; Stock or Aftermarket CPU Fan? We’ve built a variety of desktop computers and servers in the past to run Windows XP and Windows Vista. With the performance of computer components increasing and the price falling it is now possible for small business to obtain very secure and stable machines for less than the price of a second hand laptop. Since HD-TV compatible technologies are now the mainstream, and with cheaper and more reliable storage devices, we are now seeing more people adopting servers for the home; a place to store all your media content and serve it around your home or small office network. 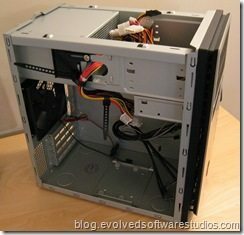 In this article, I am going to walk you through building your own small office / home network server. A 500GB RAID-protected 2.1Ghz dual core server with HD media capability. All for less than £300.00 inc VAT. Last month, Microsoft released Windows Home Server (WHS) for home users and next month, Windows Server 2008 is due for release for business users. Windows Home Server (WHS) is built on Windows Server 2003 and is designed for users who have multiple Windows Vista computers and laptops at home. It serves as a single place for all your media content and also as an automatic backup server, taking images of all your machines and files and storing them in such a way that you can restore your machines or lost files over your network automatically. Windows Home Server would be great for businesses, except that it doesn’t support the most useful business server software: Microsoft Exchange for Email. For business users, Windows Server 2008 is due to be the most reliable, secure and easy to use Windows Server platform ever. By the summer of 2008, a special “Small Business” edition of Windows Server 2008 will be released, which should have Exchange, Fax Server, IIS (for hosting websites) all pre-loaded. On the hardware side, Intel has the Core 2 Duo line of chips leading in the mainstream and performance segment, and AMD (unable to compete on performance) has dropped the prices of all it’s CPU’s across the range, and started developing “green” energy efficient processors with a 45 watt thermal design point (even less at idle). (By contrast, Intel Xeon’s in this segment draw over 100 watts). Green energy efficient design is important, not just for the planet, or your pocket book, but there are good technical reasons for buying green. Lower power means less wasteful heat is generated and therefore less noisy fans are required. This means that silent or near-silent designs are possible – especially important for Home Servers which are likely to live in the living room. To all the geek’s reading this, I’m sure you’re already running your own home server, made from bits of old junk that you have lying around. I’ve certainly done this previously. However getting parts that have high reliability, low power consumption (and high definition compatible media output) are not likely to be found in your old computer parts bucket, so we first need to go shopping to find new components with warranty! Antec are well known for creating professional, high quality cases. This case is tiny and very heavy. It has room inside for two 3.5″ hard disk drives (which means you can use RAID 0 and 1, but not 5) and one optical drive and one floppy drive. The drives are mounted on supplied silicone spacers to minimise vibration (which causes damage and noise) and to improve airflow around the drives (reduces heat and improves disk life expectancy). The Antec NSDK 3480 comes with a 380 Watt EarthWatts PSU which has a fan that spins down if it is not required – saving energy and reducing noise. There are other cases that would do just as well. If you are building a server for the home, you might want to get one of the newer DVD-player style cases which are designed to sit in your living room next to your existing DVD player or Hi-Fi system. These cases are more expensive, however. The choice of motherboard is the most critical choice of researching your build. Also because of the way in which the markets for motherboards are so cleanly split, there is usually only one or two choices for the motherboard that you should choose, all the others will not be appropriate. Since we are building an AMD based system (low power and low cost), we need an AM2 motherboard. We also need a small motherboard as we have a small case. We also need a motherboard that supports RAID 1 – drive mirroring – so that if one of our drives fails, the server can continue to run whilst we replace the broken disk. We need an Integrated Graphics Chipset (save power and money as opposed to a dedicated card). 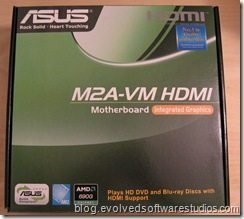 If you want to play media directly from the server to a TV, HDTV or projector then you need a fairly decent graphics processor. 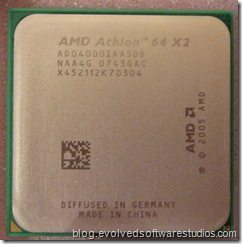 Since AMD now own ATI, all modern AMD/ATI chipsets contain fairly advanced integrated graphics processing solutions. They might not be suitable for gaming, but this is a server. 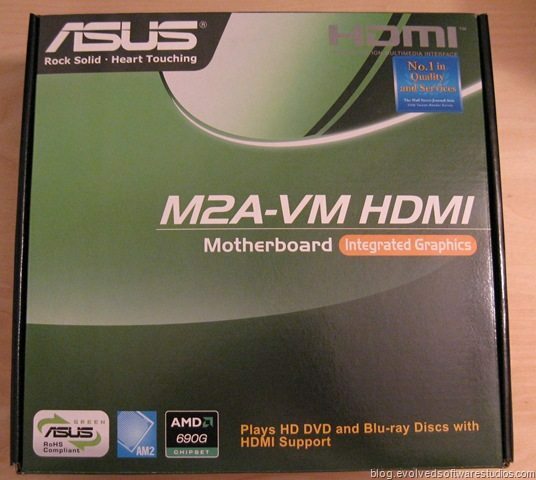 This motherboard comes with a Radeon x1250 integrated graphics chipset, which gives us up to 1900×1200 output resolution and can output high definition content via VGA, DVI, s-video, and HDMI connectors. AMD processors over Intel was an obvious choice for this segment. Almost all processors nowadays are 64bit with 32bit compatibility. Windows Home Server is only available in a 32bit version, and Windows Server 2008 is available in both 32bit and 64 bit versions. What is more important for a server is that the processor has two cores. Servers with only one core can often bottleneck at the CPU, tasks can be waiting for permission to execute. Dual Core resolves this problem. 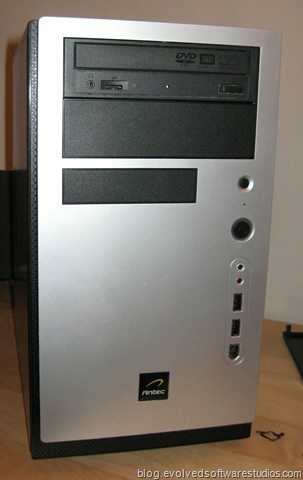 Quad Core is a waste on a home or small office server, as these small servers are most often used to serve files or host applications, not to perform heavy computation. We continue to maintain that Intel Core 2 Duo chips are the technology of choice and are also capable of very low energy consumption. 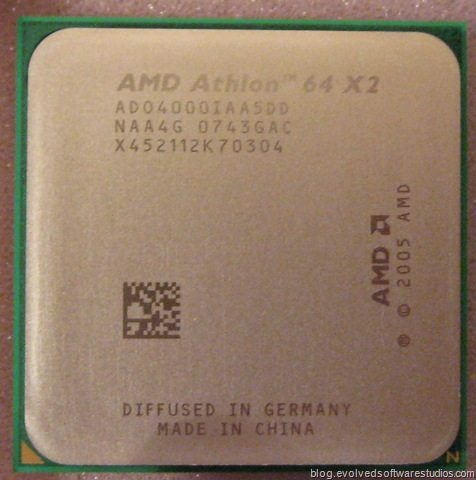 However, Intel Core 2 Duo chips cost more than twice the price of the AMD rival. Intel Chipsets (for motherboards) also don’t have the advantage of high performance integrated graphics, so we would need to purchase an additional graphics card if we were going Intel. In the low energy / low cost segment, AMD is the market leader. The Arctic Cooling AC-FRZ Freezer range are fantastic fans. Very quiet and relatively small (although larger than a stock fan). You’ll notice from my photographs that I’m not using an Arctic Cooling Fan. This is because my supplier ran out of stock. Instead I went to Maplin for a basic Akasa fan. Works just as well, but not quite as quiet as the Arctic Cooling Freezer. 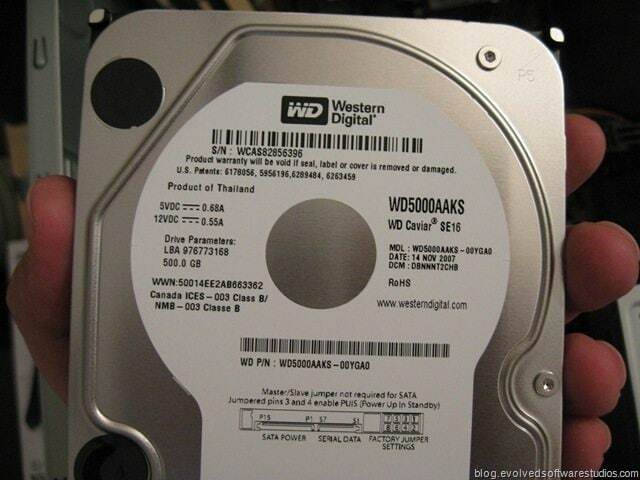 There are currently two choices for the title of “1/2 Terrabyte storage king” – the Seagate Barracuda 500GB 7200.11 and the Western Digital WD5000AAKS. 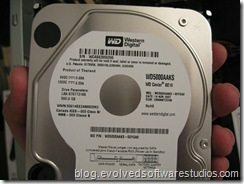 Both companies have excellent reputations for reliability, and both drives have almost exactly the same specifications – 7200 RPM spin speed, 16MB of Cache, SATA II, low seek times, and are the same price. The Western Digital drives are slightly quieter and don’t “click” as much as the Seagate drives, so for this build I went Western Digital. Since the case we are using is a small case, it only has space for 2 drives. This means that both drives will be running in RAID 1 mirrored configuration. So we will have a total of 500GB of available space. This is more than enough for a small office server. If you wanted more space, 1TB drives are available – at a cost. If you wanted to spend more on a larger case, get three 500GB drives and use RAID 5. It is just as reliable as RAID 1, but 3 x 500 GB in RAID 5 would give you 1TB of storage (1000GB). It doesn’t really matter what type of RAM you get for a home server. Even a small office server won’t notice much difference between EEC (server type error-correcting) or non-EEC RAM. The key thing to note is that you should purchase RAM that has the same clock speed frequency as your Front Side Bus (FSB). The FSB of our motherboard is 800Mhz, and it takes DDR2 RAM. So that limits our choice. 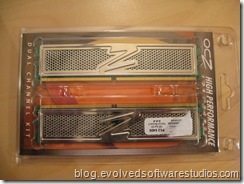 The OCZ brand of RAM is well respected, and it’s on special offer – so I went with it. 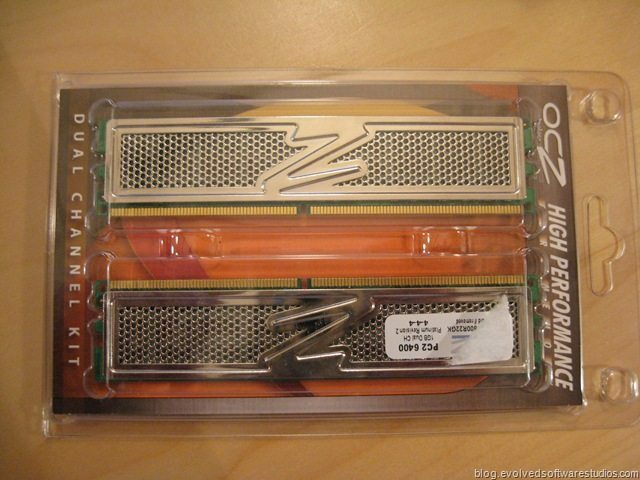 It is rare to find performance RAM available for less than value RAM. However, performance RAM tends to need to be worked harder than value RAM – this particular model needs 1.9V to be applied across it rather than the default 1.8V. I don’t think using 1.8V would cause many problems, and I would still rather have used value RAM, but we’re making a cheap PC remember? So in the real world, this was the best deal. I chose a cheap DVD writer. It turned out to be out of stock, so my order was shipped without it. The Sony DVD writer you can see in the images I had to borrow from another office machine. If you’re looking for a Blu-Ray, HD-DVD or combination high density drive, these are available. However, they cost more than £13, and we’re building a cheap server. If you wanted a more expensive server, you could go ahead and use a Blu-Ray or HD-DVD drive and it would work well with this setup. Plexus make a line of cheap and cheerful UPS’es. This one in particular comes with enough juice to keep the server running under power outage conditions for several minutes and has a built in automatic voltage regulator. The voltage regulator is very important for server applications as it prevents spikes and under-voltage (brown-outs) from reaching the server. It gives the server nice clean power and ensures that your server is going to live a nice happy life! Windows Server 2008 – Price TBC (will be more than £150). Don’t forget to order your SATA II cables, Thermal Conductivity Paste and some CAT-6 cables (for Gigabit Ethernet). Click More.. to move to building the server!